Yep it's another Christmas card today! 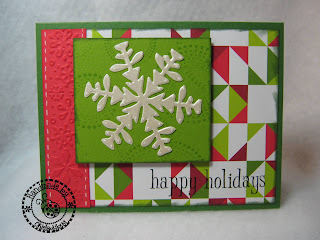 This time I used the Cuttlebug Cut and Emboss Snowflake. I love this snowflake! Do you recognize the quilt looking paper? It is the same paper I used on the stocking card from a few days ago. 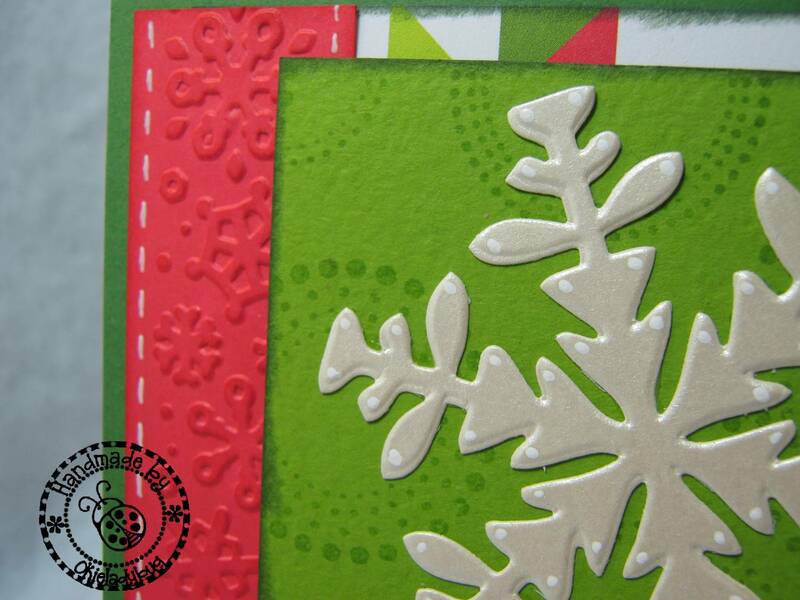 This will be another one I take to stamp club tonight for the challenge. Linda, aka LGuild, told me she doesn't like the paper and couldn't figure out what to do with it. Wait until she sees this card!! *okie laughs evilly* The red strip is the back side of the quilt print. The sentiment is a Studio G stamp...at least I think it is. Of course it is unmounted so I can't go check the block and see. 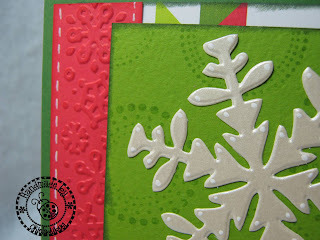 Here on the close-up you can see where I used a white Signo 153-UM pen to dot points on the snowflake. Sometimes just a few dots can really add a lot! Oh and look at the lime green paper, I used my Stamp Up background stamp and Versamark ink to give the green a little interest. 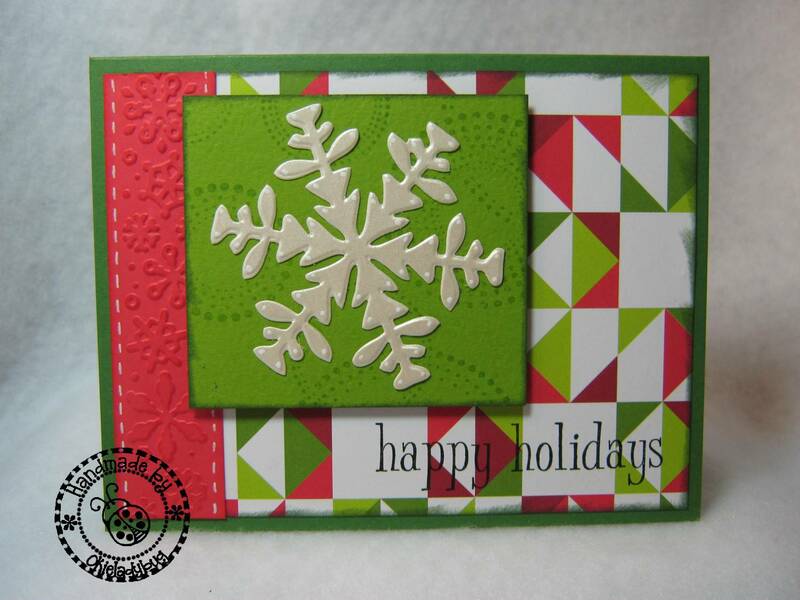 I embossed the 1" red strip with a Cuttlebug snowflake border folder and then just added some faux stitching with the white gel pen. This one was a simple card and was fast to make so I might have to make a few more depending on how many Christmas cards I need this year! Well tonight is stamp club so not sure what I will have to post from there. Sometimes I don't get anything done because Linda, aka LGuild, is always arguing with me. I think she does it on purpose so she can get more done than I do! Great card, I really love the paper. My BF and I end up laughing the whole time and dont ever get much done when we are together. Love it! I wish you could hear me singing your praises on this card! That's a cute card, Okie. And, your attention to detail fascinates me. You say it's a simple and quick card, and when I tally up all the little touches you added to it, I think about how much fun it would be to watch you work, LOL! Another very nice card. I like all the little extras you did for interest. Have fun at stamp club...so lucky to have this group! You all have such a good time.